Welcome to the Nimbin Candle factory website. We hope you're all surviving the extreme weather. Our factory is open 7days week. We're always happy to show visitors and family groups through our colourful factory. We have a beautiful display of candles available at factory prices, from standard dinner candles though to one off pieces which will delight those of you looking for a special gift. We have plenty of parking with disabled access and emenities available. Nimbin Candles is an Australian Candle manufacturer, specialising in Non-toxic, hand dipped, traditionally made candles. The factory is located in the historic Nimbin Butter Factory, located in the alternative town of Nimbin in NSW Australia. 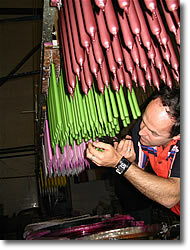 We have been manufacturing beautifully handmade Non-Toxic Dinner tapers for the Australian market Since 1973. The Nimbin Candle Factory originally started off in a shed in the Blue Knob Valley, north of Nimbin. After the shed burn down in 1989, the candle factory was relocated to "The Old Butter Factory" in 1990. 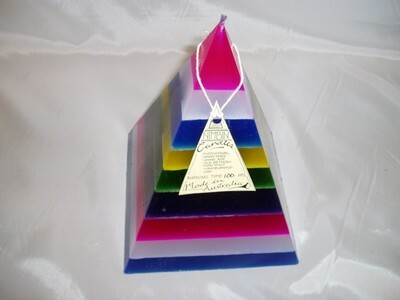 Nimbin Candles derived from the need to supply a Non-Toxic, slow burning, smokeless candle, which could be burnt in confined spaces such as caravans, tents, tepees etc, to the local community that had expanded after the Aquarius Festival in the early eighties. Nimbin Candles can now be found in many independent Grocery stores, Health Food stores and Gift shops in every State and Territory through out Australia. Nimbin Candles contain no animal products and are available through many organic and wholefood stores through out Australia as well. Nimbin candles are made using the age-old method of dipping each individual wick continuously to create a perfect taper. We use only the highest grade paraffin wax, the same wax used in food processing such as greaseproof paper, wrapping cheeses etc... 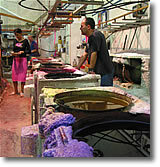 The dyes we use are vegetable dyes, the same used in batik art. The Nimbin Candle Factory in Nimbin Australia is open to the public 7 days a week. You can come and see how the candles are made. We have the only Water Driven Dipping Deck, manufacturing up to 1500 perfect tapers at a time, around and we are always happy to show you how it all works. There's plenty of parking and turning space for large vehicles, buses etc?. Groups are welcome.